It&apos;s no secret that Jennifer Lawrence is just like us — and by that we mean she really loves food. On the red carpet for last year&apos;s Academy Awards, in typical JLaw form, she famously told Ryan Seacrest she was "starving." Unlike the food-and-booze fueled Golden Globes ceremony, there is no food for the stars at the Oscars. So, while you&apos;re sitting at home munching on nachos and popcorn (classily, of course), they&apos;re stuck in the auditorium for four hours without sustenance. Last year, Jennifer Lawrence was none too pleased with this. But all her dreams came true last night, thanks to the host with the most, Ellen Degeneres. After a gag about ordering pizza for the audience, Ellen actually followed through with three pies and a very confused delivery boy. Brad Pitt handed out plastic plates and Ellen handed out slices — making sure a very pregnant Kerry Washington was taken care of — as designers everywhere shrieked at their TVs, begging the stars to cover their couture dresses in napkins and bibs. 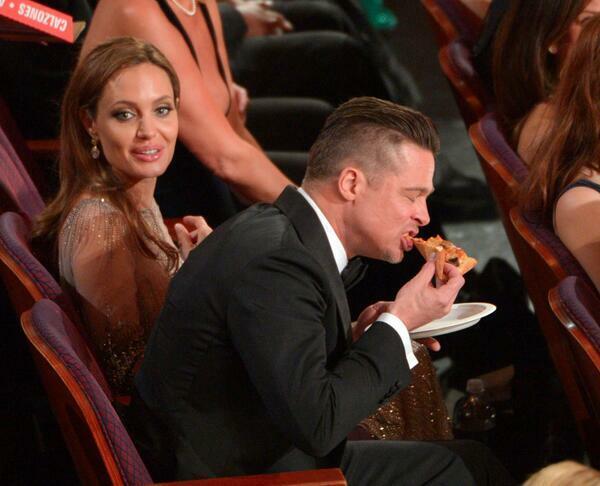 And, most significantly, JLaw, sitting in the front row, giddily got the pizza she&apos;s always wanted. And she didn&apos;t trip walking to collect it.